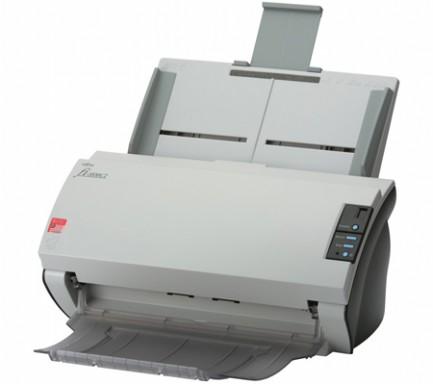 The Fujitsu fi-5530C2 is a compact A3 desktop document scanner. Its automatic document feeder will hold up to 100 A4 pages or 50 A3 pages. Fujitsu's fi-5530C2 ADF scanning speed is up to 50ppm or 100ipm in true duplex mode. The Fujitsu fi-5530C2 scanner is designed to scan up to 3,000 pages per day. The fi-5530C2 scanner supports an imprinter option that is capable of printing dates and other information on the back (FI-553PR) of scanned documents in order to simplify the search for the original document at a later date. It comes bundled with Fujitsu's PaperStream Capture scanning utility. Main features: 50ppm (100ipm), 100p ADF, A3, True Duplex, SCSI + USB2. 1 year warranty RTB.